In recent years, many pharmaceutical and biotech firms have taken advantage of contract manufacturing, research, and packaging. Both companies involved in the contract stand to benefit from such an alliance. It provides the contract manufacturing/research/packaging organization with financial stability for the duration of the agreement. The hiring company is able to reduce costs and eliminate stresses related to operating and managing a production facility and related research. Globally, the contract pharmaceutical manufacturing, research, and packaging market was valued at $248.5 billion in 2014. BCC Research projects that this market will reach nearly $352.8 billion in 2019, registering a compound annual growth rate (CAGR) of 7.3%. An aging population, the increasing incidence of chronic illnesses such as cancer and autoimmune diseases, and a growing demand for biosimilars and generics are some of the factors that are driving the pharmaceutical contract manufacturing market. The strategies of drug makers and contract manufacturing organizations (CMOs) are also contributing to market growth. Drug companies are increasing their outsourcing budgets, while CMOs are developing capabilities and expanding their capacity to meet these client needs. BCC Research analyzes four segments of the global contract pharmaceutical market: over-the-counter medications and nutraceuticals, bulk and dosage-form drugs, research, and packaging. Over-the-counter medications and nutraceuticals, comprising the largest segment in the contract manufacturing market, is expected to reach $192.3 billion in 2019, increasing at a CAGR of 6.8%. Factors driving the growth of this market include the trend toward self-medication and a larger geriatric population. The market for bulk drugs/active pharmaceutical ingredients and dosage forms through contract manufacturing is projected to increase at a CAGR of 5.4%, reaching $77.7 billion by the end of 2019. The globalization of CMOs offers significant cost advantages. Large pharma manufacturers have looked to CMOs in emerging markets, especially in Asian countries, because they offer capable services at a lower cost. Although many companies are still focused on CMOs in developing nations for these cost savings, many others are reshoring their operations back to the United States. This trend, termed “nearsourcing,” involves outsourcing research and manufacturing services to companies located in a region close to where the products will be sold. This had led to slower growth in emerging markets compared with developed regions. 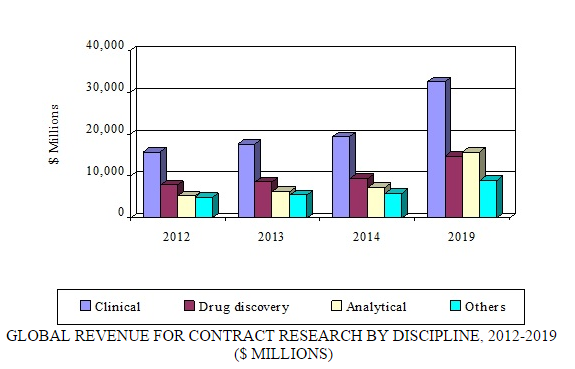 Contract research—which can include biopharmaceutical development, biological assay development, commercialization, preclinical research, clinical research, clinical trials, and pharmacovigilance—is the fastest growing segment of the overall contract pharmaceutical market. According to BCC Research's recent study, “Global Markets for Contract Pharmaceutical Manufacturing, Research and Packaging (PHM043F),” the contract research segment alone is expected to increase from $42 billion in 2014 to $72 billion in 2019, registering an 11.5% CAGR. North America and Europe are the leading markets for contract research. The use of contract research organizations (CROs) is gaining popularity because it reduces drug development costs. Intensifying pressure from generic manufacturers, patent expirations, continually rising R&D costs, the increasing complexity of clinical trials, and closer scrutiny by the FDA are forcing many pharmaceutical manufacturers to increase their efficiency via outsourcing. The number of new drugs in pipelines is on the rise due to outsourcing. For tactical and strategic reasons, CROs are being chosen for a growing number of activities. Cost-effectiveness, lack of in-house laboratory capacity, access to expertise, overall time savings, quality of results, and low volume of samples are some of the primary reasons pharmaceutical and biotechnology companies opt for contract research. Pharmaceutical developers/manufacturers are now considering outsourcing as a means to avoid or postpone significant capital investments, thereby reducing drug development costs. A huge financial investment and thorough research are required for the development of a drug. The full cost of bringing a new drug to the market is approximately $2.6 billion. Therefore, cost is a key criterion for choosing outsourcing. Moreover, it takes about 10–12 years to develop a new drug. Integrated drug discovery and development services offered by CROs allow clients the opportunity to work with a single service provider for their drug discovery and development requirements. This leads not only to seamless transition from one stage to the next, but also the associated benefits of timeline compression. The pharmaceutical contract packaging market is directly related to pharmaceutical development, manufacturing, and commercialization. Growth in pharmaceutical contract packaging is primarily due to an increase in the effectiveness of industry standards and regulations. Rises in demands for “senior-friendly” packaging, generic drugs, and the development of biosimilars are all important factors driving growth of the contract packaging market. Development of innovative drug delivery technologies also creates a demand for novel packaging solutions. Pharma manufacturers are turning to contract packaging companies to avail themselves of new and innovative technologies for the packaging of their drug products. BCC Research predicts the global market for pharmaceutical contract packaging will reach $10.4 billion by 2019, with a CAGR of 5.4%. Once considered an option, outsourcing is now an integral part of drug development and manufacturing. “Pharmaceutical outsourcing has become a viable business strategy that is enabling pharmaceutical firms to transfer non-core activities to external CMO partners in order to restructure their distribution networks, leverage resources, spread out risk, focus on issues imperative to survival, achieve a competitive advantage, and assure future growth,” says BCC Research analyst Shalini S. Dewan.